The Anvil Mages Guild is the local Mages Guild situated within the Guildgate district of Anvil. 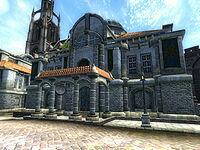 It is situated across the courtyard from the main gate, between the Anvil Fighters Guild and the local Abandoned House. The guild specializes in Restoration magic and the guildmaster is the Illusion trainer, Carahil. 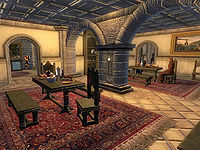 The guild itself is divided into three zones; respectively the Anvil Mages Guild, Mages Guild Library, and the Mages Guild Living Quarters. The front door opens into an entrance where Carahil can be found standing behind a desk during the day. Baeralorn visits her here in the afternoons. On the desk are a few common books, a novice retort and alembic, and two potion recipes, one to restore health and one to restore willpower. Through the doorway to the right is a small room with minor clutter, several more common books, a copy of Magic from the Sky, and novice apparatus, including a calcinator and mortar and pestle. The next room is a dining room, which contains three bottles of cheap wine as well as normal food and dishes and even more apparatus. A display case contains an empty lesser soul gem, a scroll of enthralling presence, and a copy of Mysticism. Marc Gulitte eats lunch and dinner here every day, while Carahil, Felen Relas, and Thaurron dine here only in the evenings. 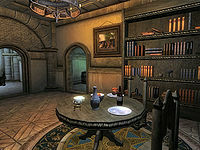 Through the doorway to the left when facing Carahil's desk is a small room where Felen Relas can be found mixing potions behind a counter every morning. On the table and counter in here are more clutter and common books along with two empty soul gems, one lesser and one petty (both owned by Felen Relas), and two scrolls (also owned by Felen Relas), one of weakness to frost and one of aquatic adaptation. Marc Gulitte spends most of his day reading in the chair in the corner. The next room can also be accessed through the dining room and contains food, clutter, and a staircase that leads to the door to the Library. Directly across from the stairway entrance is a locked door to a bedroom with a double bed where Felen Relas sleeps. The two storage options in this room are both respawning containers, and therefore unsafe for long-term storage; the chest of drawers holds clothing and the cupboard contains clutter. Through the doorway to the left of the staircase entrance is another staircase that leads up to the Living Quarters on the left, and a doorway straight ahead that leads into a room containing a fireplace, several books, and a table with normal clutter and food. On the bookshelf next to the fireplace sits a scroll of major heal other. The bookshelf next to the door holds a copy of Arcana Restored and a copy of the conjuration skill book The Doors of Oblivion. Felen Relas reads a book in here every afternoon, as does Marc Gulitte before his dinner. The door in this room leads to Carahil's bedroom with her double bed. On the table in this room are a weakness to disease scroll, a sample of nightshade and a sample of dragon's tongue, two empty soul gems - one petty and one lesser, and two potions - a weak potion of alacrity and a weak potion of charisma. On the bookshelf next to the door lies a summon headless zombie scroll. These items belong to no one, so taking them is not considered stealing. 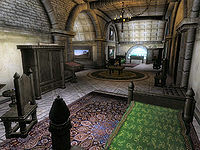 The Living Quarters is one room with one double bed and two single beds, all of which can be used by any Mages Guild member. In the area to the left is a single bed where Marc Gulitte sleeps. The chest at the foot of this bed, which contains some gold and silverware (and has a 25% chance of containing jewelry), does not respawn and so is safe for storage. The desk, with a Scroll of shocking burst, a potion of fire shield, and a copy of Origin of the Mages Guild sitting on top, respawns, and so is not safe for storage. A scroll of river walk is on top of the cupboard, which also respawns. The table next to the cupboard holds a sample of nightshade, a sample of ambrosia and an ultra rare sample of lichor. The display case holds a red velvet outfit and a jeweled necklace. In the area to the right is another single bed where Thaurron sleeps. The cupboard here also respawns, making it unsafe for long-term storage. On top of the cupboard are two poisons - one weak poison of debilitation and one weak poison of sickness. On the table next to the window you'll find the rare aqua silk robes and a matching hood, as well as a strong potion of luck and one poison of paralysis. In the area across from the entrance is a double bed, with a leveled weapons and armor chest at the foot. This chest does not respawn. On the bookshelf here sits a silver dagger and common books and clutter.